Family-friendly apartments right in the adventure area "moving mountain Golm"! - TOP 1 - ganzer erster Stock! TOP 1 - ganzer erster Stock! Very bright and comfortable apartment NEW (remodeling Spring 2016). 3 DZ - two of them with washing facilities. 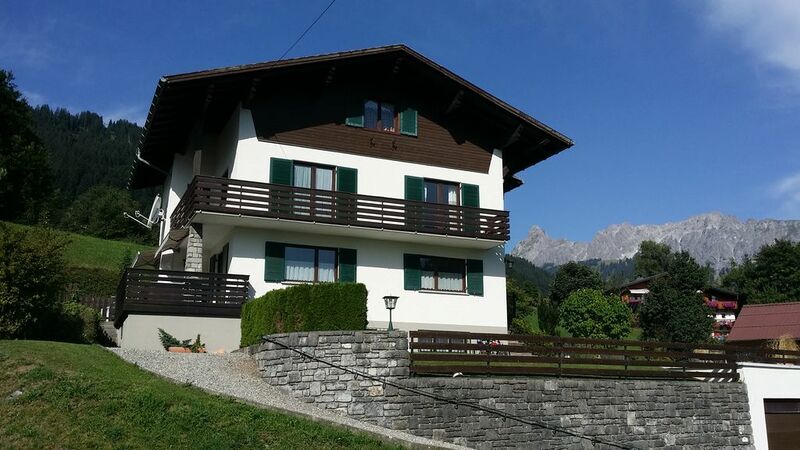 From 2 bedrooms and the living room direct access to the balcony with stunning views of the valley to Schruns-Tschagguns. The house is located at 1 000 m in Schruns-Tschagguns in the heart of the Montafon in the west of Austria. Top skiing and hiking, as well as numerous trips in the magnificent mountain scenery make your stay with us will be a great experience. Why should you spend as our guest your vacation? Quite simply - besides our comfortable accommodation, gastronomy and a perfect service we offer something very special. Because from spring to winter waiting daily changing and exciting experiences with professional local guides for you, many of them for the whole family. Whether hiking, (E-) biking or climbing - the adventure program Mountains Plus discover from May to October, the Montafon from relaxed cozy up active sporty tailored just for you. Whether a Alpwanderung with cheese tasting or a high alpine hike whether comfortably discover on the e-bike region or detect challenging bike trails every drop of sweat, whether dare the high ropes course or via ferrata in airy heights - with mountains Plus is for everyone guaranteed. From December to April, it is then called "On s walking in the snow" when snowshoeing are through snowy mountain scenery, cultural and historical Dämmerwanderungen, Llama trekking in the sunset or curling on the program. And the best part? As our guests, taking charge of all the activities of mountain Plus part, because your holiday adventures are included in your stay. Je kunt hier alle kanten op. skiroute 23: 20 meter lopen. Skibus 100 meter en 2 minuten naar skigebied Golm. In het huis alles aanwezig. Prima bedden. 1 slaapkamer heeft een te smal bed voor 2 personen (1,20 breed), 1 slaapkamer heeft echter weer 3 bedden. In de woonkamer 1 bedbank en 6 eetstoelen. Iedereen kan dus niet comfortabel zitten. 1 douche en w.c. in dezelfde ruimte. Prachtig uitzicht op het dal. Balkon tot 4 uur in de zon (20 februari) Wij hadden een garage voor 2 auto's. Contact met de eigenaar verloopt uitstekend. Prima restaurant op 200 m.
Grüaß di Peter, vielen Dank für die tolle Bewertung. Würde mich sehr freuen, euch wieder bei mir begrüßen zu dürfen. We had a great stay at Roland’s appartment, it was clean, cosy and comfortable. Host was very hospitable and provided a lot of helpful tips / advice. Furthermore close to the ski area, easily reachable by bus. Will definitely go back there again. Hi Eugene, thank you very much! Looking forward to be your host again. Traumhafte Lage, top gewartete Wohnung, Geschirrspüler, Flat-TV... Ideal für Familien mit bis zu 2 Kindern. Wir hatten eine großartige Skiurlaubswoche in Latschau. Die Ferienwohnung ist perfekt eingerichtet ubd sehr schön. Man kann zu Fuß zur Golmer-Bahn laufen in ca. 5 min. und ins Skigebiet hoch fahren. Das Skigebiet ist toll, vor allem auch für Kinder. Es gibt ein sehr gutes Restaurant direkt um die Ecke. Sicher ist es auch im Sommer toll zum Wandern! Wir kommen bestimmt wieder! Der Vermieter ist sehr nett und erreichbar, falls etwas wäre. Perfekte Wohnung für Ski- oder Wanderurlaub im Montafon!!! Wir waren zwei Familien mit Kleinkinder, die eine tolle Skiferienwoche in dieser Ferienwohnung verbringen durften. Die Wohnung war sauber, gepflegt und Nahe der Gondelstation der Golm-Bahn. Der Kontakt zum Vermieter war bereits im Vorfeld sehr angenehm, was sich bei der Ankunft bestätigte. Wir wurden wärmstens willkommen geheissen und all unsere Wünsche wurden sofort umgesetzt. Wir kommen sehr gerne wieder! Even Ernest Hemingway loved the charm of the two main places in the heart of the Montafon and perpetuated the memories in his books. Today, modern cable cars delight as attractive sporting, cultural and leisure facilities all year round. Whether for family fun in Vorarlberg's largest amusement park Montafon Activity Park, swimming in the Alpenbad Montafon, guided tours in the bike base, thrills climbing park, open-air sports or strolling in the historic center - be active theme. The locations are the central starting point for all ski and hiking areas in the valley and by train or private car all year round easily accessible. The apartment is located in Tschagguns in the district Latschau (1 000 m ü.d. M.) in the immediate vicinity of the Golmerbahn.